A brilliantly existential work from epigrammatic writer Will Eno explores a town in the middle of things. Always being in the middle of things, Eno’s brilliant new work reminds us, is an uncertain but unavoidable endeavor. Making its Chicago debut after bowing in New York last fall, Middletown feels like a continuation—perhaps a culmination—of the playwright’s previous works such as Tragedy: A Tragedy and Thom Pain (based on nothing): meditations on the big existential questions of life and death, and the ways language helps us cope with our dearth of answers. Mapped onto a small town that’s defined, literally, by its location between other points, Middletown is structured a bit like Our Town with doubt (though, pointedly, there’s no Stage Manager nor a third-act afterlife, as those would imply omniscience and answers). 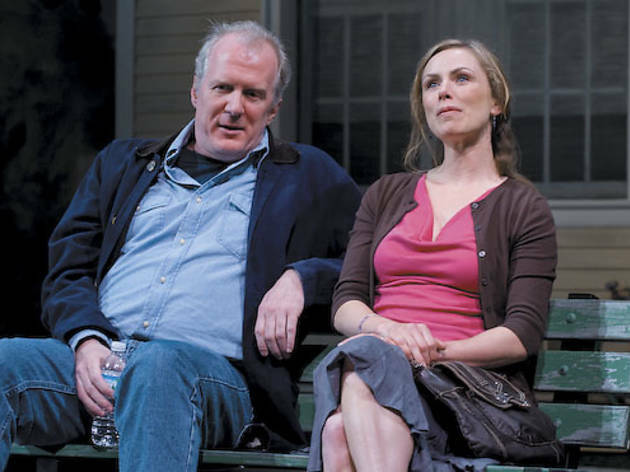 Our “main two,” as one character puts it, are new resident Mary Swanson (a luminous Brenda Barrie), longing to start a family with her often-absent husband, and lifelong Middletowner John Dodge (a flinty, searching Tracy Letts), a lonely, depressive odd-jobber. Most of Middletown’s residents, it seems, are lonely. Through the first three-quarters of Eno’s script, they’re identified only by their occupations: Cop (Danny McCarthy), Librarian (Martha Lavey), Mechanic (Michael Patrick Thornton), Female Doctor (Ora Jones). Suddenly, there’s a shift; Eno’s characters begin addressing each other by names, and you sense the members of this outstanding ensemble instantly adding facets to their portrayals by dint of their human connections to others. Not everyone will go for Eno’s quippy, epigrammatic approach. But if you’re down with exploring the middle without necessarily reaching an end, you’ve found your place.